After Tyler wrote a post about using surf socks to protect your boards, I decided to take mine out from the closet and start using it again. I got one made by Julie Designs called the Stik Sock a few years ago and used it for a little while, but then started getting lazy. I guess I forgot what the benefits were of using them until Tyler reminded me. I started using it again everyday and can definitely see the advantages. There are two main benefits that I have found in using the Stik Sock, the first being that it protects the board from rough surfaces. When I put the board in the back of a truck and drive it on the bumpy road to the beach, I feel like it is a lot safer from minor dings and scratches. Also when I’m done surfing I can put it right in the sock and set it on the ground while I change, which is much safer than putting it on the rough ground without it. The second benefit is keeping the board clean. I hate when I go surfing with a bunch of people and we stack the boards up getting wax on the bottom of everyone’s boards. This way no matter how many boards we stack, my board stays clean and protected. 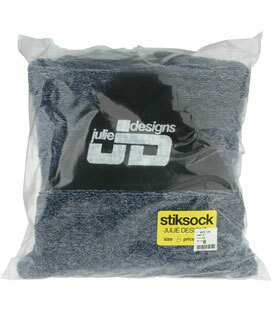 This surf sock by Julie Designs costs only $25, and is available online and in many different surf shops. I definitely recommend picking one up.